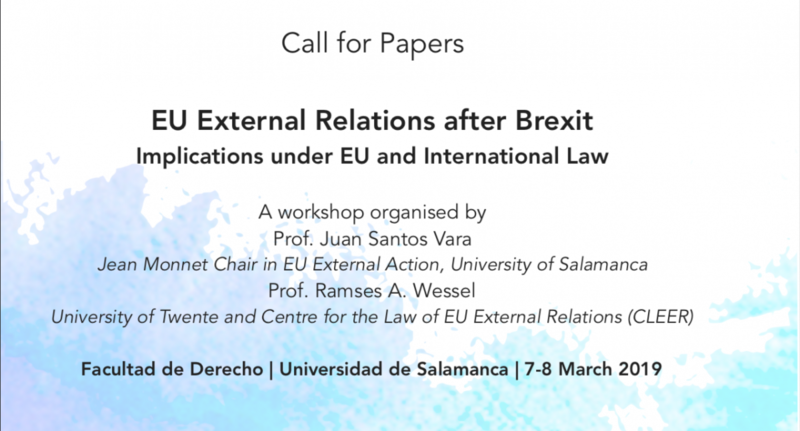 This workshop will analyse and discuss the applicable rules of both EU and international law in relation to the withdrawal of the United Kingdom from the European Union. It will focus on the impact of the withdrawal agreement and the arrangement for the future EU-UK relations on the existing external relations regime of the European Union. Interested researchers (in every stage of their careers) should submit an English abstract of around 500 words (approximately one page) addressing the conference theme at savajuan@usal.es no later than 30 November 2018. Please include your name, email and affiliation along with your abstract. As we aim for the publication of a book, paper proposals will be subject to a strict selection. The selection of the papers will be communicated to the speakers by the end of December 2018. Confirmed participants are expected to provide complete drafts of their papers of around 8000 words no later than 1 March 2019. For further details, clic here.